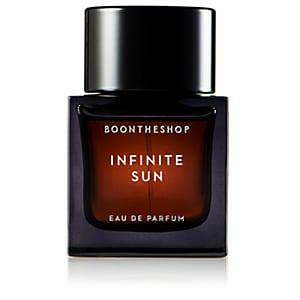 Boon The Shop's Infinite Sun eau de parfum is a fresh, crisp fragrance showcasing a balance of fruity and floral notes. This scent is finished with a delicate, gentle base of ambrox and musk. Top notes: bergamot, peach, apricot. Middle notes: peony, jasmine, lily of the valley. Base notes: ambrox, musk. 1.7 fl oz/50ml. Boon The Shop Women's Infinite Sun Eau De Parfum 50ml A great designer gift. Shop Boon The Shop at Barneys New York.